It’s almost America’s 242nd birthday, which usually means food, fireworks, booze and late-night emergency room visits for digit reattachments. 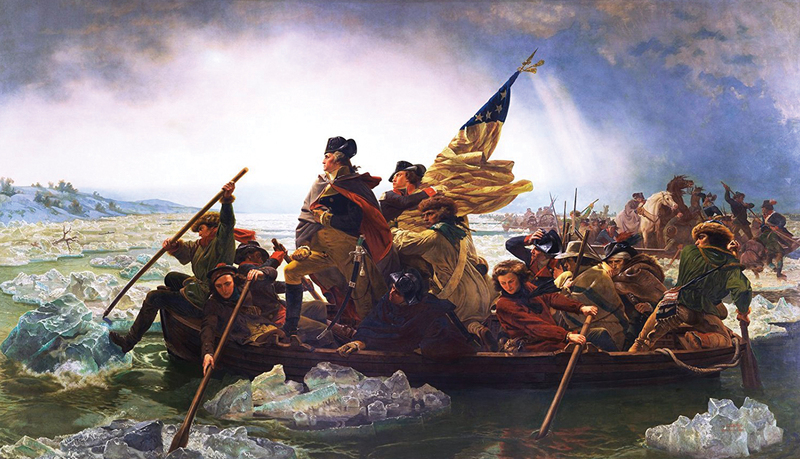 “Washington Crossing the Delaware” by Emanuel Gottlieb Leutze. To celebrate the Fourth of July a little early, I thought I’d take a look at some of the cutting edge science back in 1776. Starting with the king of the cutting edge: the guillotine. The design of an automatic body-shortening machine was popularized by French physician and politician, Joseph-Ignace Guillotin. Europe has a history of brutal public executions, something Dr. Guillotin sought to end with the aid of a machine. Beheading was seen as a noble death for some reason, as opposed to the hangings the common man received. A reliable machine was believed to help bring balance between the classes and cause quick and painless executions. That’s right! Feel grateful for your rights! You, too, can lose your head for stealing that loaf of bread, Mr. Valjean! The irony of it all was that Dr. Guillotin hated the device as much as he hated the idea of capital punishment being a thing at all, which was a lot. This was made even worse by the fact that his name would be forever attached to one of the most feared machines the world would ever know for all eternity. A device more relevant to America in 1776 was the bayonet, which was basically a spear or knife at the end of your gun. Bayonets are still used in military service, though their use is rare. When you can spit out 30 lethal rounds with the grip of your finger, why use a knife? Well, what happens when you and the guy shooting at you a few feet away stop to reload? Turning a gun into a spear in 1776 wasn’t exactly new tech. Soldiers had been doing it for as long they had been using gunpowder to fling hot metal at other soldiers. What was new to 1776, and the coming Revolutionary War, was the design of ring bayonets, where the device was slipped down and locked around the barrel of the musket. Previous designs were called plug bayonets, and you literally plugged the end of your gun. That meant when the knife went in, you couldn’t shoot anymore. A simple problem solved by putting a hole in something designed to put holes in other things! On a less awesome but more widely used technological accomplishment of the Revolutionary War was the flush toilet. For our entire evolutionary lifespan, up until about 1775, we did our business in boxes or pits for all the world to smell. In 1775, the S-trap was developed, a device that you can find under your sink and toilet to this day. It traps water after a flush to create a seal that blocks air from the sewer or your septic from stinking up your bathroom. I mean, it’s not as awesome as an explosion, but I bet you’ve gotten more use from S-traps in your life than fireworks! On the topic of water, many people don’t realize that a submarine was used during the Revolutionary War. I know what you’re thinking: Tony Stark got sent back in time to ensure American victory in the Revolution. If only, that’d be an awesome movie. The American submarine in the Revolution looked like a big egg powered by a single guy that appeared to be riding a bicycle. George Washington found it uncouth, but authorized its use during the war for planting explosives on British warships. England, after all, had the most powerful navy in the world. It failed miserably three times, but seeing that a guy could go underwater in a device and come back without getting wet opened the door for other underwater endeavors. Other devices for underwater exploration were developed that paved the way for Scuba tech we use today, including compressed air tanks and leather diving suits and breathing systems that worked for as much as an hour at a time. Most of that development was on the hostile side of the pond, but scientific progress is progress! Perhaps inspired by the ingenuity of the S-trap, Benjamin Franklin invented the Franklin Stove around 1776. The Franklin Stove allowed people to cook over open fire while it vented smoke out of the structure. This doesn’t sound like a big deal now , but that’s thanks to the Franklin Stove. What they don’t show you in all of those medieval and fantasy movies is that whenever the tavernkeep has a roaring fire going, the smoke would realistically be billowing all over the structure and giving everyone lung cancer. Benjamin Franklin researched thermodynamics and figured out how to direct smoke by using a baffle, a hollow metal divider, that was cooled by outside air to siphon smoke into an S-shaped duct and out of the house through a chimney. Ultimately, his stove went on to help inspire a new wave of thermal engineers to create things like rocket mass heaters and small pellet stoves. American history may not be everyone’s party o’tea, but after your fourth burger and sixth hot dog, be thankful someone had the bright idea to invent the flush toilet!